Sometimes, I look back at the food items I have tried, and think to myself, “What were you thinking?” I ask myself if I seriously thought that that particular item would be good. Often times, I laugh at it and say, you are crazy and move on with my life. But, for this item we will be discussing, this was really not enough. It has been just about 1 month since I ate this and I still find myself shaking my head at myself. 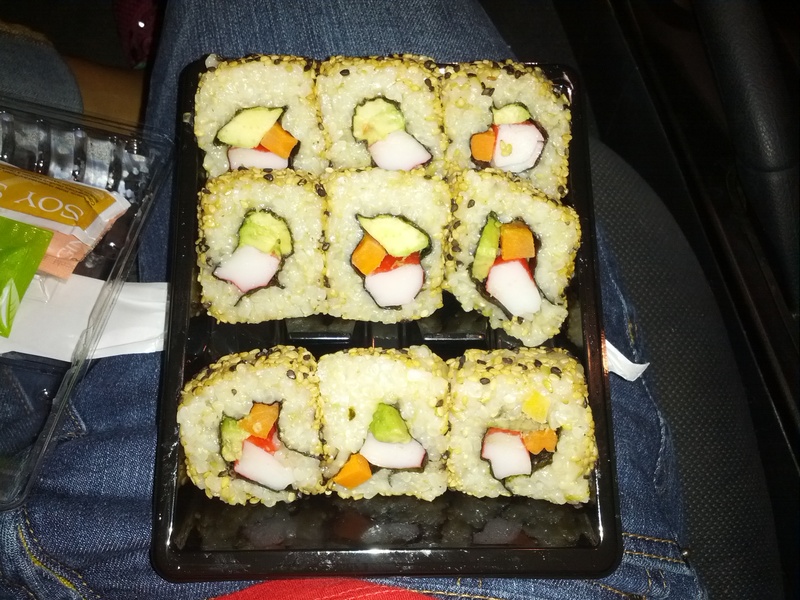 The item I speak of was Fujisan Sushi, picked up at Super Target. Now, Publix and Whole Foods have a sushi chef that make the sushi on a daily basis. But, Super Target does not. And this is a fact I have known and know at this point. So Nicki, Why Oh Why? I was at Super Target to finish up my Christmas Stocking shopping on a Friday night after work. It was about 7pm by the time I finished and I was hungry but, not too hungry. I had a few more stops to make before home so I went to the refrigerated pre-made meal area to find something. 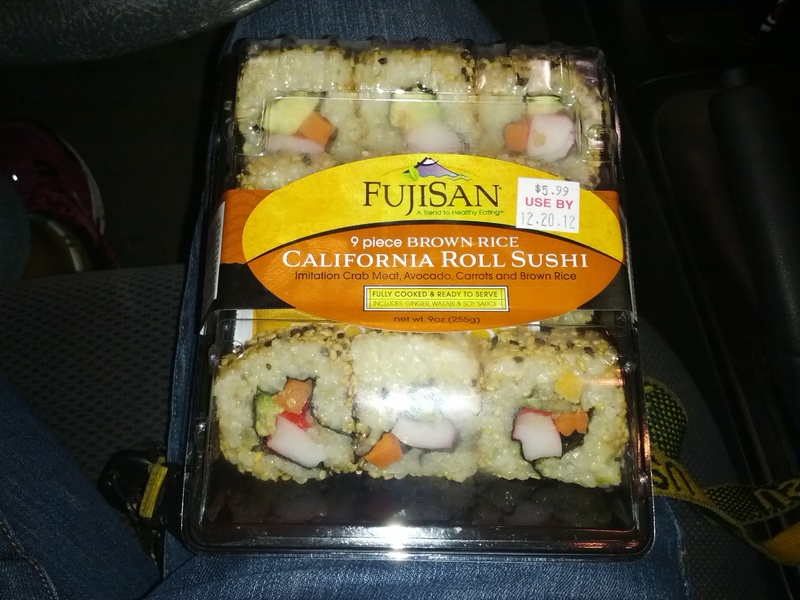 For whatever reason, I selected this Fujisan Brown Rice California Roll Sushi package. Why, I ask myself, would I ever purchase sushi that I know was not pre-made. I bought it anyway and brought it out to my car. Once I arrived, I opened it up and tried a roll. Blah. Blah is a really good way to describe this stuff. By far, this was the worst food consistency, I think I have ever had. It was a mixture of mushy, salty, chewy and funky-aftertaste all wrapped up into individual rolls. While I was chewing this, I could not determine the different pieces of the roll. All of the flavors combined into one – one that was so gross. The rice was so beyond mushy and the crab, or what I presume was the crab, was salty like no tomorrow. As for the veggies & avocado, I would have had no idea if they were missing. 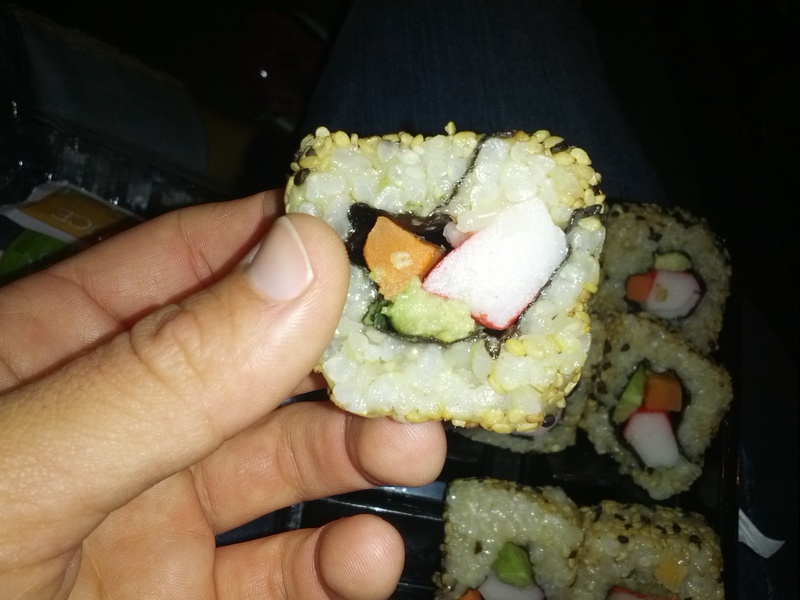 I can not stress enough how BIZARRE and GROSS the consistency of this sushi was. Why Oh Why? I was only able to eat 4 of the rolls before I simply could not do it anymore. My gag reflex took over and I had to stop. As much as I hate wasting food, I really had no option. To conitnue on would have been a tourmet to my tastebuds and a killer on my gag reflex. If you are ever presented with sushi, that you know was not made fresh, please do not purchase it. And, if you ever see this Fujisan Sushi, run far far away. Do not make the mistakes that I seem to make over and over. If you do, you will be left asking yourself, Why Oh Why?